Raising cross cultural kids means different things at different times during their lives. It’s hard to say how much my American-ness influenced them when they were babies. I’d like to think there was an American influence but in reality, maybe not so much. I do know that before my eldest went to school, his accent was not as British as it was after he started school. None of the others ever had an American-influenced accent before they went to school. 6 year old: thinks I’m a bit stupid because I constantly get words wrong – all the time. Especially when I call trousers pants and trainers sneakers. Well what can I say? I’m hard-wired American! He also thinks I’m sort of an alien because I hail from another ‘world’ and he can never remember what that ‘other world’ is called but likes the sound of it. He can’t recall visiting Florida or going to Disney but he loves looking at the photos. Chats non stop to his American Grandmother over the phone and Skype. Unfortunately, she can’t understand a word he says. 12 year old: Gives me pathetic looks when I say things like play clothes and other Americanisms such as Math and suppertime. Has very fond memories of Florida, especially the neighbors she made friends with, the climate and the culture. Understands many of the cultural differences between the two countries and likes to talk about it with me. Sometimes mixes up American pronunciation and spellings with her native British way of saying and spelling words. When this happens at school she is mortified and her friends laugh at her (hopefully in a friendly way). Is incredibly reserved and very British by nature but is interested in my background, her American grandparents and likes the idea of America. Loves peanut butter instead of marmite. That is definitely my fault! Almost 14 year old (his birthday is July 2nd, Whoop whoop! ): Loves all things American especially food such as Kraft Macaroni Cheese, chocolate chip cookies, brownies, Mountain Dew, iced tea, real lemonade, Cheetos and American candy. Loves America and wants to go there on his own when he’s older to travel and to work. Games with American kids online and calls me ‘retarded’ when I suggest that he tell them he’s half American. Actually he calls me ‘retarded’ quite often these days, doesn’t really matter much what I say. I think that must be a teenager thing rather than a cultural thing. Loves to shop online with me for American food-stuffs and treats. Buys me stuff when he’s out and about and sees something that I will love like Cheetos or Reese’s Peanut Butter Cups. Fields lots of questions from his friends such as ‘why do all Americans have guns?’ and ‘Is it true that Americans eat hamburgers everyday?’ Knows who George Washington and Abraham Lincoln are and what they did, the significance of Thanksgiving and the 4th of July and can’t wait to visit America again. Such an interesting read! My girls are 5 and 2, half Russian/half Ukrainian, the older one lived in 4 countries so far. Have no idea how they will be like in 5-10 years! I think, that it’s nice that your kids found some way to identify themselves, whether it’s British or American, instead of just being confused about it. I think yours will be very smart, speaking several languages and very worldly. What an amazing experience for them! Love this post. I find it really interesting to read how your children behave/ react. My daughter has a strong British accent after being here 3 years, my son not so much. Given they have 3 countries they are more complicated in their view. Apparently my daughters’ friends love my Aussie accent! Thanks Cathy! I wonder why your son’s accent hasn’t become more British? And I wonder if it will in the future… interesting! My friend and co-author Heidi has 3 kids who were all born in England. They moved to the USA a few years ago and they all now have American accents. I remember when her eldest was a toddler and she called Heidi ‘mom’ instead of ‘mum’ and that was when they were living here. I find it all so fascinating. When I was a teenager in England, I knew an American family. The eldest daughter had a slight American accent, the middle one had a very pronounced Southern (American) accent and the much younger ‘baby’ of the family also had a slight accent. I don’t know if they moved around much while they were still in the USA, with the middle one learning to speak while in a different part of the country, but I think it also has a lot to do with how musical you are and how good an ‘ear’ you have. Personally I don’t pick up accents easily, but a very musical friend of mine is a great mimic and can adapt her accent very quickly. My husband makes fun of me when I try and do the British accent. I really can’t do it at all, BUT my accent has softened and my intonation has changed and of course I use way more British words and expressions now. It’s funny because someone I’ve know for a while through my business didn’t realize I was from the US and exclaimed very loudly – You’re AMERICAN??!!! It was as if she was outraged by the discovery that I wasn’t British. Too funny 🙂 Thanks for your comment. I bet they had moved around a bit and also moved to England after all the kids were born. 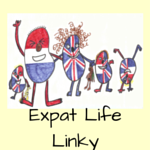 I really hope when I and my partner have children here they are not going to become “very British” as you described your 12 year old – but then my experience of Brits is that they are insufferably judgemental, closed minded and unfriendly to the core. Hi Kasia, I’m so sorry. It sounds like you’ve had nothing but negative experiences with British people and yes, from the outside looking in, they may appear to be as you’ve described and perhaps you’ve met one or two who were like this. But really they are not at all that way! I’ve made some wonderful friends here and I also know a lot of people through work and mostly I’ve found them to be extremely kind and friendly. They are mostly reserved and that can sometimes seem to be unfriendly. It does take time but once you get to know them, they can be truly loyal and truly friends for life. My children represent what is great about British culture and also what is great about American culture. I think there are good and bad people everywhere and you sometimes encounter the bad. But please don’t be judgmental about British people because what you say is not true.